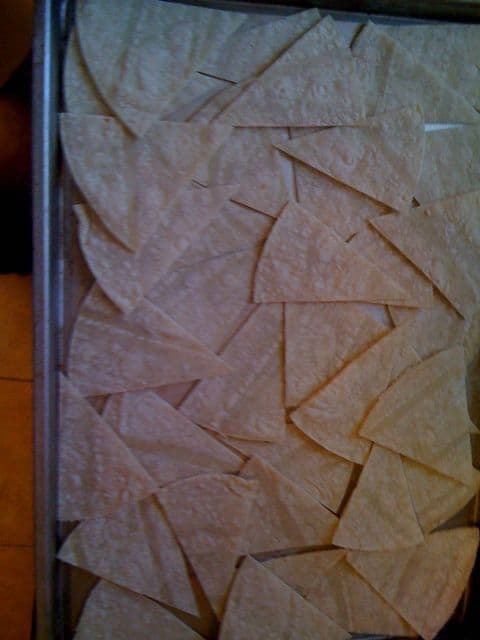 This is my quick and simple recipe that might seem pointless… until you realize the kind of control you can take over your own tortilla chips! You might be wondering why this is such a big deal… just hold tight. Pre-heat your oven at 350 degrees. 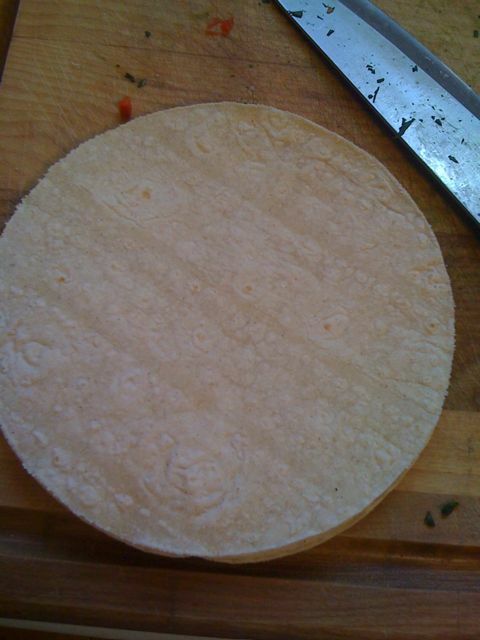 Take a handful of corn tortillas, and stack them on top of one another like in the following picture. Got a chef’s knife or other large knife? Keep it nearby. 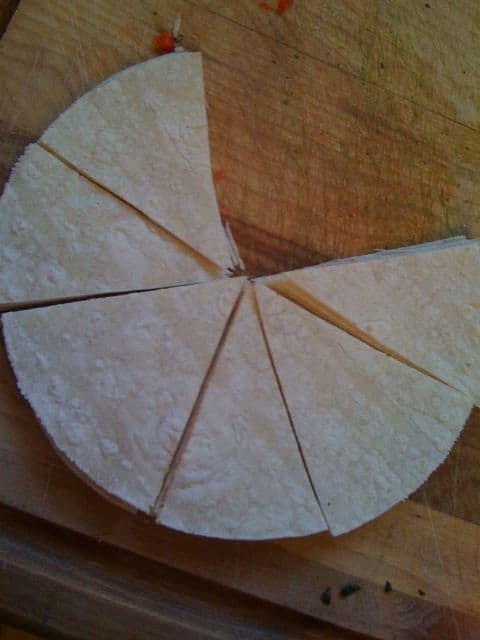 Dice your tortillas the same way you’d dice a pizza… eight slices. Take your new slices, and lay them across a baking pan. Laying them across one another is okay but if you do it the first time and they’re not crunchy enough, then you may want to lay them evenly across the pan without having them touch after that. Bake them in the oven for approximately 8 minutes. Keep an eye on them, though – you don’t want to wind up with your chips too brown. A nice light golden color – like pictured below – should suffice quite fine. Now.. why does this matter? Because this gives you so much more control: no more random chemicals in your tortilla chips, no preservatives, no salt… nothing. You can control the portions. You can control just how crunchy they are. You can even control the flavor – brush the soft tortillas with lime or lemon juice and sprinkle with a little paprika before you cut them. 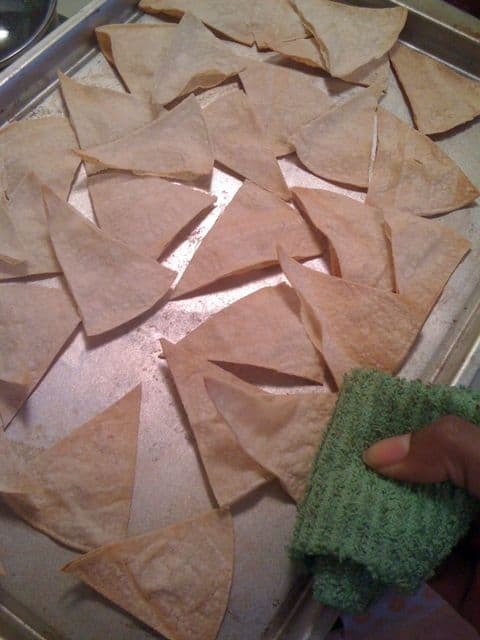 Brush a tiny amount of water on each tortilla, dust it with your favorite spice blend.. and you’re good to go! Would this work for corn tortillas also? Thank you so much for a positive blog with a personal touch. I am new to clean eating, but I knew I had to give up processed foods if I was gonna make some permanent changes. I cook for my family, but I am excited about trying some of these recipes, especially spinach & artichoke dip w/chips! BTW….I read your article in Essence, that’s how I found you. Hi, this is a major recipe for me. I have been over indulging on tortilla chips for a few months. It never crossed my mind to make my own. The recipe turned out great, and I was able to control my portions. I added lemon juice and a little salt. These were actually more filling than the versions at the store, and the price was $1.98 for 36 tortillas (yes!). I usually pay $3.99 for a bag. I cut up three, and had some left over. Thanks for the recipe, keep up the great work. THANK YOU for this! like many people, i am a tortilla chip junkie, lol. now i can indulge without (as many) nutritional concerns. also, thank you for all the recipes you post. i feel so empowered knowing i CAN make the things i love and not have to worry about chemicals/additives. you are amazing and inspirational! I never thought of this I must try this when I want to make a dish for Thanksgiving. To go a step further, make your own tortillas to start with at home! I’ve been following the recipe here http://www.homesicktexan.com/2007/03/and-end-to-my-quest-flour-tortillas.html for several years now. My wife comes in the kitchen practically drooling when she realized I’ve started a batch. It’s a little more time intensive, but allows you to control every ingredient. And so worth it flavor-wise. Hi Erika! This is a great post! I love corn tortillas. Now you showed us how to make them in chips? That’s even better. Your trick is so simple and I love the fact we can control the salt intake. Love it! Do you think this would work with wheat tortillas? Perhaps not as crunchy, but definitely worth a shot.